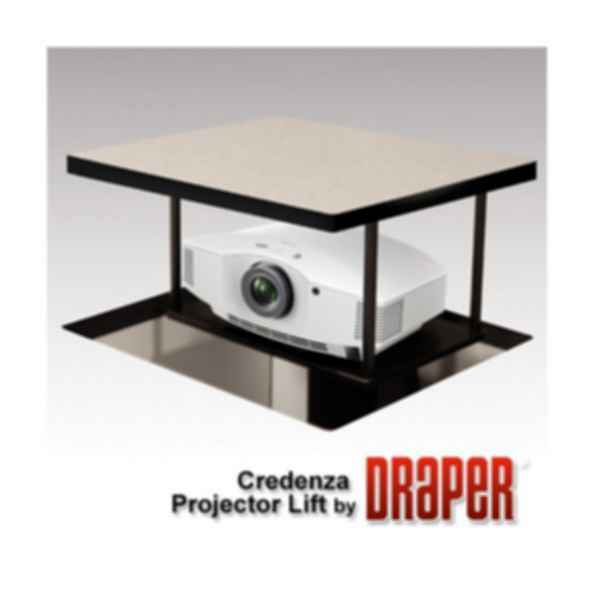 The Credenza Lift conceals your projector in a credenza, cabinet, or table and raises it quickly and quietly into position when it's time for a conference to begin. When concealed, your projector is protected and out of the way. • Features 12" (30cm) vertical travel and a tiny footprint, making it easy to install in virtually any conference room furnishings. • Interior shelf height is adjustable. • Required opening in furnishing top is lift shelf size (width and depth) 1/2" (12mm). AeroLift 25/50/150 Projector Lift Wright Line Inc.
Draper Micro Projector Lift Wright Line Inc.
Scissor Lift SL - Projector Lift Wright Line Inc. Founded in 1934, Wright Line had a history of excellence outfitting technology-intensive environments with its strong rack and airflow management portfolio. Since Eaton's acquisition of Wright Line in 2010, we've offered a stronger, more robust set of solutions for data centers. Rest assured that the trusted, quality products from Wright Line are thriving under the Eaton brand. We look forward to your continued business and to our continued growth as Eaton. More Products from Wright Line Inc.